When People STINK, Just Remember You STINK Too! I personally happen to love them. You can slice ‘em, dice ‘em, or serve ‘em up sautéed or grilled. I really don’t care how they are prepared—I pretty much like onions in everything except dessert. Whoever decided that an onion should be covered in batter and fried in a savory pallet of seasonings then served up with I-have-no-idea-what-this-yummy-sauce-is, was a genius. So for all the onion haters out there, I get that onions are less than appealing. And I would never eat an onion raw and naked. It at least has to be tucked in between meat and bread or layered in a bowl of greens. It isn’t a walk in the park to prepare them either. Once you manage to penetrate the papery shell that houses the onion, you are sucker punched with a pungent odor that has the power to melt your face off. The truth is, we have to get past all of the initial reactions we have about onions in odor, I mean in “order” to fully appreciate them. And onions are best enjoyed when they are covered or drenched in something else. And you know what else has layers? 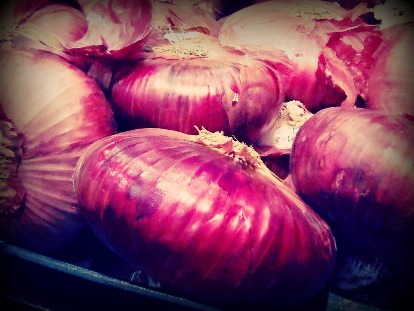 You see, onions stink, can make you cry, and can actually even burn you if you get an extra potent one…kind of like people. People have baggage—LAYERS of baggage. Sometimes we don’t know how to set our own junk aside in order to love others well. Even those hardest to love. But the hardest people to love are those who need love the most. Jesus desires that we would love others as He first loved us. People aren’t onions. And honestly if there are oniony-like people in our lives it is because God put them there. As we ponder those hardest to love in our lives, the first thing we must do is be careful to realize we, ourselves, could be that “difficult person” to love in the life of someone else. Second, if we would have the mind of Christ, and love people in the way He loves us—even when we are/were a stinkin’ sinful mess—it will change the way we think. And when the way we think changes, our actions change. Love for those filled with hatred. At the end of the day, we are the face of Jesus to the world. And before Christ we are all a proverbial onions. But Christ came and cleansed us with the covering of His precious blood. In so doing, He took what was vile and made it something wonderful. We have the chance to be instruments of grace to people in our lives. And just like an onion covered in a yummy batter, when we are covered with grace (and in love cover those around us with the same grace) it is nothing short of glorious! This entry was posted in Uncategorized and tagged grace covers, love, People stink. Bookmark the permalink. “At the end of the day, we are the face of Jesus to the world.” …. So true, right on , and high five! We are, as Christians, the face of the Lord. Let us never demean His holy and pure image. I love your usual & wonderful take on the #livefree prompt: bloom. God has gifted you with such a creative mind. (Enjoyed the #Shrek reference, too.) #writeon sister! Oops….not “usual”, but “unusual”. The coffee hasn’t quite kicked in yet this morning. Note to self: proof before post. I love this post – it has so many layers of truth to it. Other people’s odors, the aroma of Christ (that amazes me! ), and applying it all in our love towards others. I’m reminded of the main character, Christy, in the Catherine Marshall book who couldn’t tolerate the smell of her students, initially, until the time she really cared for them, and then she no longer was bothered by it. Great post! Being grateful that God has given us the sense of smell so we can enjoy the many fragrances of life, something simple and fresh and inviting aroma of after-shave lotion,in the morning. Or the mellow smell of freshly cut grass in spring and there are the savoury aromas of delicious food. Be a blessing, it is a fragrant thing to do.